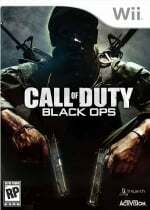 Those who have enjoyed the Call of Duty franchise's previous outings on Nintendo platforms will surely be disappointed to learn of retail outlet GameStop's omission of the upcoming Call of Duty: Black Ops' Wii incarnation on its pre-order listing. Activision has yet to officially announce which systems will carry the title, so it's all speculation at this point. But based on this new development, however, it's looking more likely that Black Ops will either unfortunately see a delayed Wii release or possibly none at all. Treyarch, the developers of this year's entry, have been Wii-friendly for past Call of Duty games, delivering versions of their previous entries Call of Duty 3 and World at War. The studio also ported Infinity Ward's Call of Duty: Modern Warfare to Wii in November 2009, two years after the game was originally released on PC and HD consoles. The Wii lacks a version of Modern Warfare 2. I would love this to come to the Wii, but shouldn't we get MD2 first? Just sayin. I'll be really optimistic and say that Modern Warfare 2 and Black Ops will come together in a package deal! @V8: You could, or couldn't care less? @Panda: I approve of this grammar correction! I, for one, couldN'T care less. I'm no fan of the series in general, and very much doubt that a Wii version could stand up to the PS3 version anyway. How well did the Wii version of Modern Warfare sell? I'll wait for an official announcement. If anything, they may make a Wii version at a later time. "Could care less" is a real phrase and means the same thing as "couldn't care less," even if it probably began with people ommitting the "n't". More like Call of Doodie: Black Poops if you ask me! The only thing echoing in my mind is "Reflex Edition". Raise your hand if your shocked..... exactly. It's Activision, so I really could care less either way. @Panda I could care less by not making a comment. See how that works? @V8 Ninja No, you were correct before! It has a release date already? Probably just hitting the Wii later than the other versions. I honestly hope not. Last thing we need is another severely water down port. Last time I checked, CoD4 turned out pretty well on the Wii. They should make it for Wii... if it played as smoothly with the Wii's controls as Metroid Prime Trilogy. Another Call of Duty game? Whatever. Well, I would be looking forward to it, but it is highly likely that they won't make four player split screen with it on the Wii (since nobody but high voltage software can seem to figure out how to do it). I will just wait till Conduit 2 comes out and enjoy that instead. CoD: MWR was good though, but it was lacking four player split screen as mentioned above. Who cares. Activision is driving this franchise into the ground anyway. Bad news for only Wii owners! I personally don't care since I would prefer the Xbox360 version anyway. If HD versions (with Dolby Digital 5.1 sound) are available why should I buy a multiplatform title on Wii? well ima buy this on 360 since its in HD,and 20x better ONLINE play then Wii. I don't enjoy the Call of Duty games. They are all about shooting and violence and NO Creativity. @zkaplan: Of course I know what it's SUPPOSED to mean, but it's mangled English any way you look at it, and it bothers me. That said, I must agree with the logic in V8 Ninja's second post...I could also care less, as I bothered to click on the news announcement in the first place. @Egg meister: GameStop's usually on the ball when it comes to upcoming releases, actually. There have been several games I've seen in the system before they were even ANNOUNCED, with Sonic's Ultimate Genesis Collection coming first in my mind. Believe me, if Activision was planning a Wii version of this game, GameStop would know about it already.